Your Source For the Cleanest Ammo Cans and Stripper Clips! First and foremost, thank you for visiting cleanammocans.com! We are not your average surplus store. We are a veteran-owned and operated small business dedicated to providing good deals on top- notch ammo cans, and stripper clips and responsive customer service. We apply a modern, customer-oriented approach to service with the goal of providing the simplest, fastest, and most reliable customer experience from the time you place your order, to the time our products arrive at your door. Over the last few years, we have sold thousands of the cleanest surplus ammo cans on the market, to an increasing base of satisfied customers. Our repeat customers are our biggest asset, and let us know we are doing it right! Through unique relationships with our partners in the defense industry, we are able to offer high quality, lightly used surplus ammo cans and stripper clips that appear to be new, but at prices significantly lower than retail. 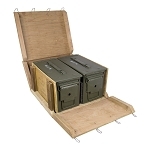 Cleanammocans.com is the only online source for ammo boxes in authentic, military issue, wire-bound wood ammunition crates. We are so confident in the quality of our surplus ammo cans and stripper clips, we offer a satisfaction guarantee on everything we sell. If you have questions, comments, or concerns about our products, or require support with an order that has been placed, we are only a couple mouse clicks away. Please feel free to contact us through the "contact us" page and one of our team members will get back to you right away. We have gained thousands of satisfied customers and are excited for the opportunity to earn your confidence! Check us out on Instagram @king.of.cans! 2019 Tax Season Sale is Live! 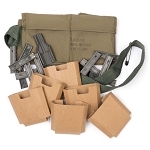 Grade 1 M19A1 30 Cal Ammo Can Bulk Packs! Happy belated New Year everyone! 2018 was another year of growth for Clean Ammo Cans that brought new products, new relationships, and many new customers. It has been a pleasure interacting with the many of you that have reached out for assistance, or sent us emails providing your feedback on our products and service. For 2019, we are excited to continue exploring new ways we can better serve our customers. 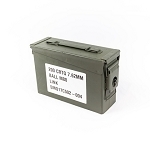 Based on your feedback, we are introducing 6 and 12 packs of like new, USA Made, Mil-Spec, M19A1 30 cal size ammo cans. 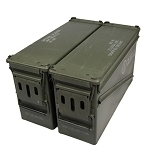 For customers requiring a half dozen or more cans, these new bulk packs of ammo cans will reduce the shipping expense as well as the per can price, offering a more economical solution for higher volume ammo can applications. 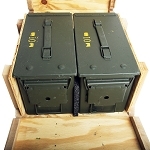 It is now possible to get a larger quantity of clean, like new, once opened, 30 cal M19A1 ammo cans shipped to your door for much less than before! 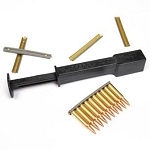 .308 Stripper Clip and Bandolier Repack Kits for the M14/M1A Rifles now in stock! There is nothing we love more than new product announcements and this is a big one! We have been receiving requests for .308/7.62x51 stripper clips for the M14 and M1A rifles for a long time and we finally got them. CleanAmmoCans.com has secured a lot of .308 / 7.62x51 stripper clips, and bandoliers for the M14 and M1A rifles from a 2016 production run that are available immediately in our online store until we sell out. We have a limited supply from a one-time production run so don’t wait around on this one! Yellow Letter 30 cal and 50 cal Ammo Cans are Back in Stock! 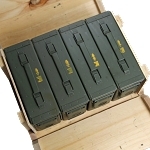 We are happy to announce the receipt of a large lot of yellow lettered M19A1 30 cal ammo cans and 50 cal size M2A1 ammo cans. The Lake City Army Ammunition Plant (LCAAP) has discontinued the yellow lettering on their ammunition production line in favor of white digital printed lettering. The new cans are the same USA made quality, but the white type just doesn’t have the same classic military style as the discontinued yellow cans. These are likely some of the last of the un-issued classic yellow lettered Lake City cans that will be available outside of government auction channels. 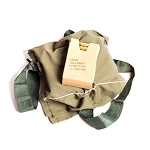 As the remaining few of the yellow cans travel through the supply chain, they have been harder and harder to find but are available here for a limited time in their original wood ammunition crates. 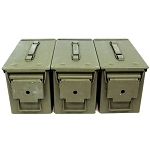 The Upgraded M2A2 Ammo Cans Are Now Available! 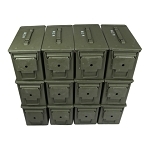 CleanAmmoCans.com is excited to announce the arrival of the elusive M2A2 50 cal size 5.56 ammo cans! We’ve had them trickling in periodically for the past couple of months but have finally amassed a large enough lot to reliably provide them as an option to our customers. The M2A2 model of ammo can is still hard to find since they have only been utilized for military spec ammunition within the last couple years and have not fully hit the military surplus market yet. Commercial ammo is still shipping from Lake City in M2A1 cans. Read on to learn about the M2A2 ammo can design improvement!